Hey everyone! 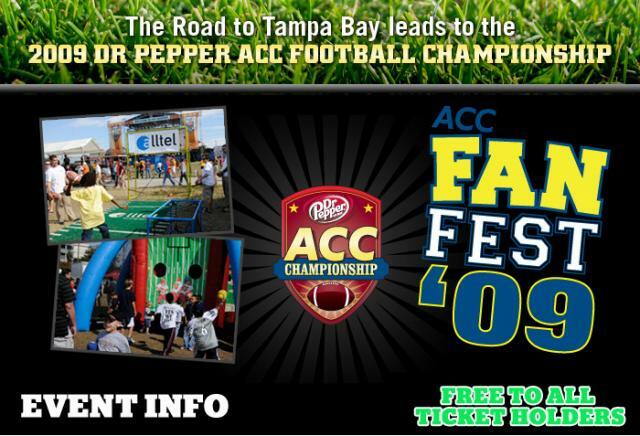 Travis back with more great Tampa Bay area events surrounding the 2009 ACC Football Championship. If you can&apos;t tell by now, there&apos;s plenty to do to get involved in the Championship this year. Well, this is some Tampa Bay entertainment you want to pay attention to. We are heading out the the ACC FanFest, which is the biggest party during the 48-hour celebration of ACC football. It will start at 5pm, and it will be held on the South Side of Raymond James stadium...right next to where the hard-hitting ACC ACtion will be at 8pm! There will be over 200,000 square feet of interactive games, clinics, team mascots, pep rallies, food and beverage, autograph signings, game merchandise, jumbotrons and general family fun. And, country music star James Otto will perform a pre-game concert, beginning at 6:30pm. Plus, this event is FREE to all ticketholders. So, if you have your ticket to the 2009 ACC Championship, this is the place to be. And if you don&apos;t, you really need to go get a ticket because this place will be rockin&apos;! So, get your ticket and plan to be there. if you want more info, just log on to www.theroadtotampabay.com. And as always, keep checking back here for more great things to do in Tampa Bay!